The world of ballet is splendid. The beautiful dance you see on the stage can embrace you fully while you will be enchanted by the movement of the dancers. But how much do we know what is really going on behind the scenes: the stress, budget cut, the dancers that try to compete against each other to be the first choice or even injury? What about those who never end up on the stage to showcase the outstanding result of their hard work? In Thierry Demaizière and Alban Teurlai’s film “Reset” you will get the chance to have an exclusive look into Benjamin Millepied’s most important preparation of his life – to present the 33-minute ballet at Palais Garnier as a Dance Director of the Opera National de Paris. It begins with the charming atmosphere where Benjamin Millepied finds himself at the opening Gala at Palais Garnier. Everything you see around promises a magnificent night for everyone who got lucky enough to get the ticket. But shortly after, the viewer is taken to thirty-nine days earlier, when Benjamin Millepied receives the first recording by composer Nico Muhly. As you watch him gasping every note of the score, you will realize how sensitive an artist he is. Even though he still has enough time to prepare for the big night, it seems, with the music of Muhly he had already orchestrated the entire upcoming event in his own head. While the dancers and the director take their first step, as if he were a little child who learns to walk, it’s fascinating to learn how much they all have to go through before presenting their achievements on the big stage. Benjamin Millepied, who was named the dance director of the Opera National De Paris seems to fully understand his responsibility as his tremendous effort and dedication helps the dancers to gain the needed confidence and even not to be so upset about the injury, that might not only ruin their entire career as a ballet dancer. Reset is a movie that teaches you the insights of ballet. However, it may not deliver enough drama one might expect, but enough to energize the viewer throughout. The filmmakers having their own way to envision the film, it comes up as an excellent result as if there were not a single confrontation during the editing of the final piece. 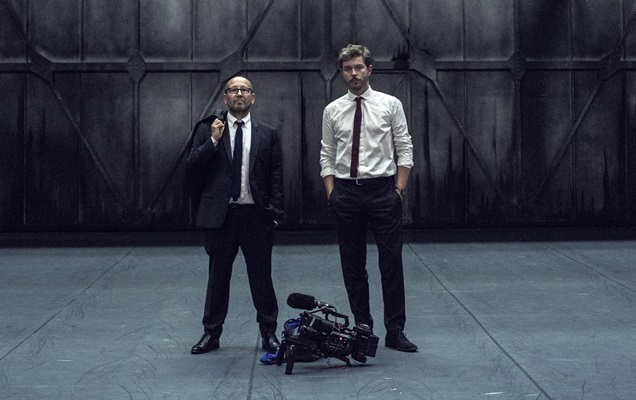 This is why talking with Thierry Demaizière and Alban Teurlai was important to find out more details about the filming process, as well as the idea of even getting into it in the first place. Even though I never believed in having online interviews via emails, this time, I could not be happier as the outcome of it has simply exceeded my expectations. MOVIEMOVESME: What was so special about your idea that you both decided to make a documentary film about Benjamin Millepied and ballet? AT: To be honest, we didn’t come up with the idea all by ourselves. It was Dimitri Chamblas, former dancer and director of “la 3eme scène” (The Paris Opera’s digital platform) and childhood friend of Benjamin Millepied’s, who came to us with the project. Benjamin Millepied had seen Ballet 422, a film about Justin Peck, a NYC Ballet choreographer, which was released in 2015 and wanted his own ballet to be filmed. Despite the fact that he had already collaborated many times with the Paris Opera Ballet, it was his very first project as the institution’s Director of Dance. TD : We didn’t know when we began making the film that his first ballet at the Paris Opera would also be his last, and that the film would become a sort of testament to his vain attempt to modernize an old-fashioned institution that was extremely reticent to make any drastic changes. MOVIEMOVIESME: How long did it take you to convince Benjamin Millepied to become the documentary subject? TD : We didn’t have to convince him because the initial desire to make the film came from him. Time was an important factor: we met him for the first time in mid-May and the rehearsals began at the beginning of June. We’re documentary makers specialized in portraiture. We had shown Benjamin two of our films (Karl Lagerfeld, A Lonely King and Revolver, a film about the French actor, Vincent Lindon) and he seemed to be won over both by the style and the content. The next step was to quickly finance the film. Our first reaction was to make a feature film for cinema because we instantly saw the potential of the subject, but faced with such a number of hurdles to cross in such a short time, we opted for television. Canal+ immediately accepted to join the venture and we started filming just a few days after having seen them. AT : And what happened next is incredible: the film was broadcast on French TV and spotted by Upside Distribution who asked to team up with us. They took the film to Tribeca Film Festival where it was screened as world premiere. Since then, the film has been shown at many international festivals, been bought in 14 countries, and a longer cinema version was released in French cinemas this September. MOVIEMOVESME: As a filmmaker and a human being, you, I am sure, have two different approach in making a film. What kind of skills you both needed to use in order to work together in one complete film? AT: RESET is our 11th film and the fruit of over 15 years of collaborating together. Despite the fact that our roles are in theory very precisely defined, we share a common sensitivity which leads us in a similar direction, even if we do sometimes have moments when we don’t agree. Thierry often starts working on a film before me and I finish the film after him. It’s often Thierry who approaches the protagonists and develops the angles of the film that we’ll put in place. Once the film has been shot and the structure has been established, I spend an enormous amount of time modifying it, refining it and adding the finishing touches until the end result pleases both of us. MOVIEMOVESME: Was there something special about the ballet you both have learnt during the process? AT: What impressed me the most was the personal implication and self-sacrifice that the dancers demonstrate in comparison with the fleeting duration of a ballet. They rehearse for more than 30 days, 8 hours a day, giving everything they’ve got for a ballet that will only be shown 11 times. Watching them rehearse, searching for the purest gesture or the perfect movement, it sometimes seemed unbelievable that the ballet would only be shown a handful of times in public. TD: The other very striking thing is that when you film these world-class dancers from such close proximity, you become aware of the balance between their physical strength and fragility. You have to watch them jump, catch and lift each other from a very close distance to understand how much strength and vitality is required of them. But, at the same time, you see in the film how omnipresent injuries are. It’s a worry that constantly preoccupies them. They take care of themselves, protecting their bodies, but when they make the wrong move or an imperfect catch, it can be awful. They’re immediately taken out of the ballet and perhaps even removed from the whole dance season. We witnessed certain dancers injure themselves on the night of the premiere and hide their pain from the staff so not to lose their role. MOVIEMOVESME: I am sure there were many days and night you spent in editing room to finalize the film. How challenging it was to come up with the final version that could have please the Benjamin Millepied and of course, us, the audience? We wanted to tell the story of the creation of a ballet but also to make the spectator understand the almost imperceptible tensions that were growing day by day between Benjamin and the institution. We wanted to hint at why he left with the footage that we were able to access. At the Paris Opera Ballet it’s forbidden to film the technical crew and many meetings that are held behind closed doors. AT: The other fear that we had was to make a “flat” film that lacked a mounting suspense, as in the end everybody already knew that the ballet had already taken place. Luckily for us, and this is the great power and beauty of documentary making, there are things that you can’t control. You can plan your shooting and editing schedules as best you can but there will always be things that happen irrespective of your wishes, and if you are in the right place at the right time, all you need to do is shoot. Specifically, there was the conflict between Millepied and the institution, which lead to industrial action being taken just a few days before the ballet’s premiere, which creates a perfect tension that keeps the audience on tenterhooks. And then there are secondary characters who you just don’t expect to discover when you start a shoot. Here I’m especially thinking of Virginia, Benjamin’s assistant, who is an extraordinary supporting character who gives an edge of comedy and a sense lightness to the film. TD: With all of there ingredients bound together, we had to make some complicated choices in the editing suite, but nevertheless, we were never worried about Millepied’s reaction to the finished film. And we weren’t disappointed: he was an out-and-out fan of the film and found that the edit faithfully reflected the 3 months we’d spent with him. In France, the film was very successful with the press and the public. Let’s hope the same will happen here! MOVIEMOVESME: Many filmmakers work alone, maybe, because it`s easier to deal with themselves rather with someone else, who may or may not disagree with his/her idea to direct a film in any way a filmmaker wants. Could you share your experience in terms of having two directors working on one film and being so special about? Well, again, we’ve been working together for about 15 years, we’re sensitive to the same things, despite some inevitable differences of opinion. But over time, we’ve learnt that our disagreements aren’t an obstacle but, conversely, are our strength. When you work by yourself, totally unchallenged, you can lose yourself in a sense of certainty which can become totally obsolete as the shoot and the edit go on, and you end up exhausted and unable to correct your mistakes. Being a duo allows you to hone an irreplaceable quality: allowing yourself to work within a permanent dialogue that fuels your sense of investigation right up until the last day of editing. For some, this could put the brakes on their creativity, but with us it does the opposite: exchange is a source of endless vitality.